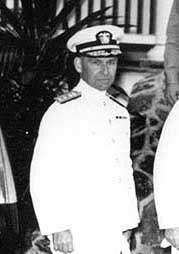 The Pacific War Online Encyclopedia: Newton, John H.
John H. Newton was Commander, Cruisers, Scouting Force at the outbreak of war. At the moment of the attack on Pearl Harbor, he was in tactical command of the Lexington task force, which was on the way to deliver aircraft to Midway. After war broke out, the Lexington force was given to the more senior Brown, and Newton commanded its screen. Relieved before the end of the year, he was given command of the South Pacific Area in June 1944, when it had lost almost all strategic relevance. Newton was considered a capable administrator and served in high administrative postings during most of the war.